I just got back from our last trip of the year. 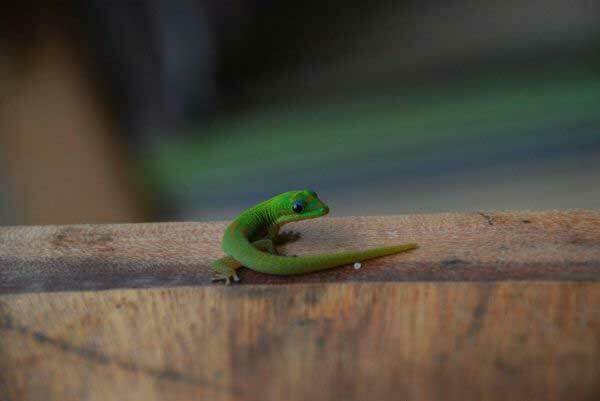 We went to Madagascar, where we fished with Madagascar Fishing Adventures. This outfit has become the operators of choice for those serious about doing some quality jigging and popping in the area. 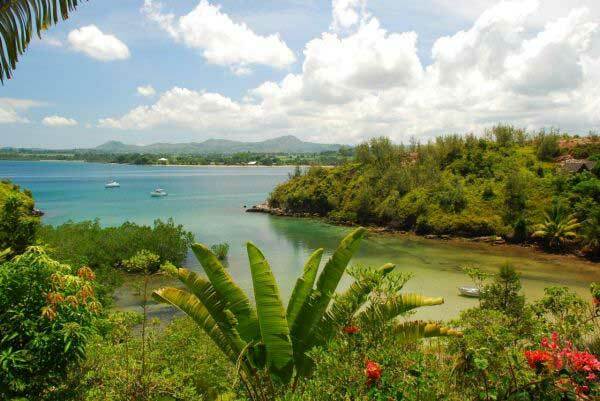 We started out from Nosy Sakatia, where the outfit is currently based, at a comfortable and scenic little guesthouse above a pretty little private bay. Our mission was not to stay at the guesthouse this trip, but to do a journey, fishing along the way, to explore some new waters. 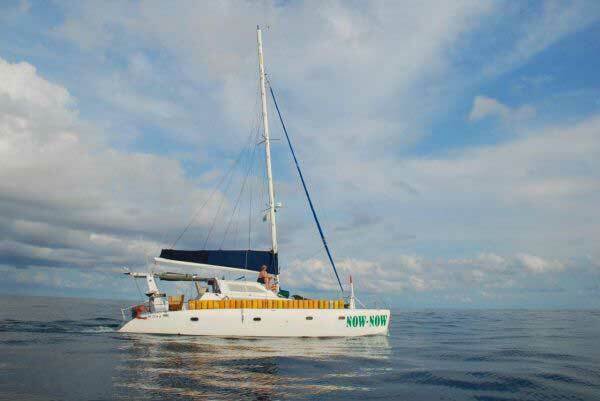 We had the use of a Yacht called "Now Now" to sleep on, and travelled and fished by day from "King Julien", Madagascar Fishing Adventures' excellent fishing craft. Travelling and fishing this way meant that we were never fishing the same spots for two consecutive days, and gave us the opportunity to sample many reefs, islands and drop offs over a huge distance. We met up with Now Now every evening after a day of exploring to have a delicious dinner, a couple of beverages and a good night's sleep. 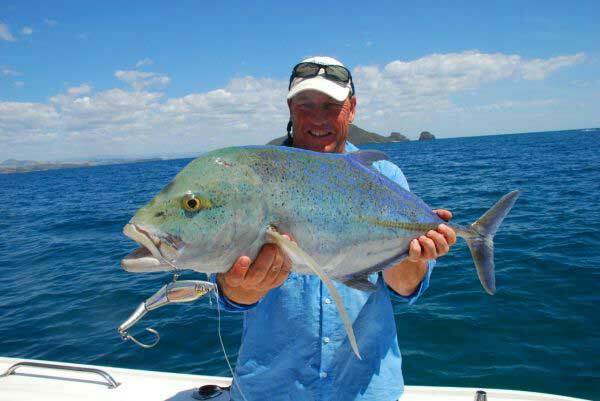 We caught an interesting variety of species, with particular emphasis on the kingfish (trevally) family. One of the fish was a Tille Kingfish (Caranx tille) that I caught over a shallow reef on light tackle dropshot one afternoon. This species is seldom found off the African Mainland, so it was great to catch one of these interesting fish and get the opportunity to have a good look at it. 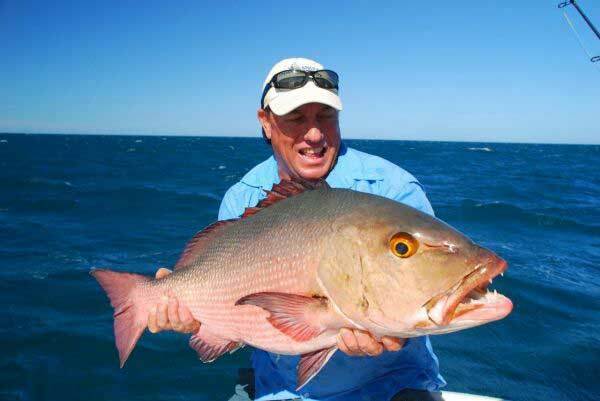 I also caught a large Bohar Snapper, which took a Darkstar Tuna 100 popper in shallow water, while popping for GT's along a reef edge. It was a really great specimen and took all of my efforts to keep him out of the reef in such shallow water. Jason, the operations manager at MFA was with us and caught a lovely GT in the same spot, which gave him the run around on the boat. This fish smashed a popper with a huge burst of white water. 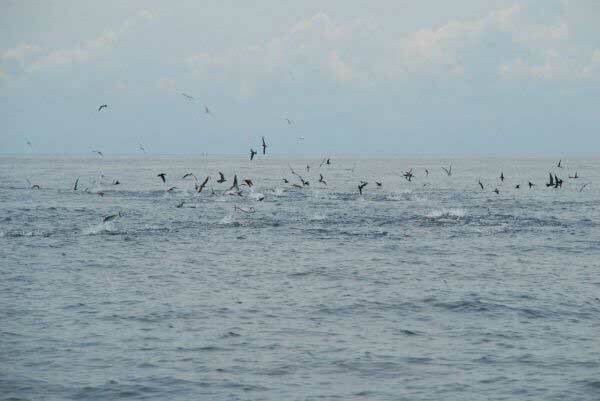 We came across a flock of diving birds and thought that were feeding above some bonnies, but as we got closer we saw that the fish below were some sort of kingfish. I had a light rod ready (Berkley Venom Tiger with a Penn Conquer 4000 reel), with a small spoon on which I had been planning to flick for a bonnie. I cast the spoon amongst the kingies and went tight immediately, as they were feeding on tiny sprats at the time, which the spoon imitated perfectly. The fish gave me a terrific fight on the flick stick and when I landed it I saw that it was a species of kingie that I have not come across before. It looked something like a big Greenspot Kingfish, but is something different. I am still trying to ID it, as it doesn't seem to appear in Smith's Sea Fishes. Shortly after that we came across more birds feeding and I had another go with the same flick stick and spoon and hooked into an even stronger fish. This one fought deep and hard for a while before I got him up and saw that I had hooked a decent GT on such light tackle. A real handful on such light tackle, and a pleasure to land! I had some Sebile Magic swimmers that I had been wanting to try on the trip. I replaced the trebles with single hooks and worked the lure like a jerkbait in the shallows around the islands. This lure turned out to be absolutely deadly, and wasn't left alone by the predatory fish. Everything from king mackerel, to kingfish smashed it and it wasn't long before it was my number one go-to lure for the shallow waters. 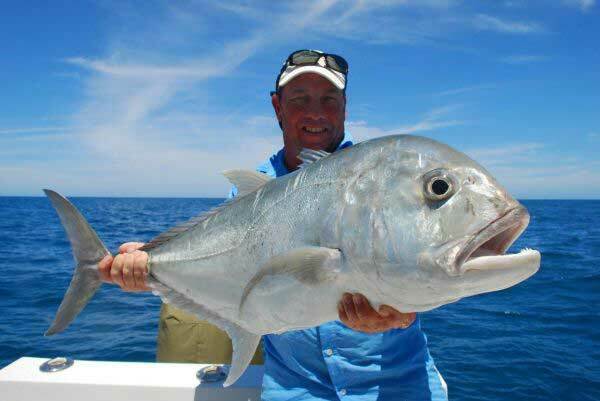 Below is a good Bluefin King that I caught on it. 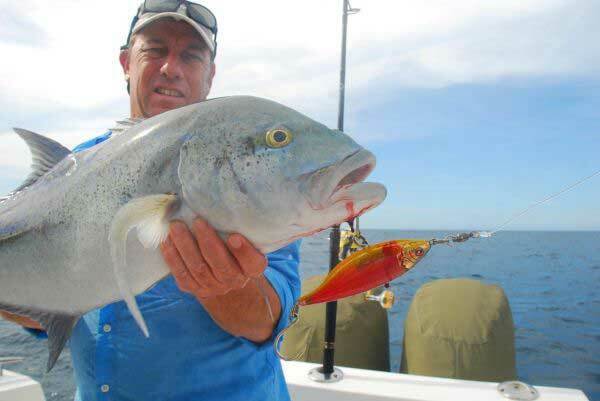 The jointed lure has an unbelievably attractive swimming action, and seems to drive fish crazy! 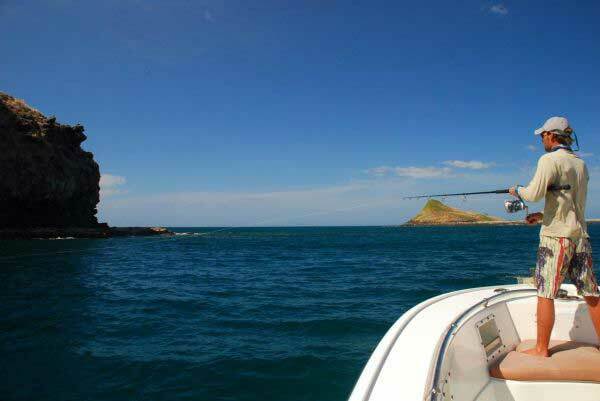 The islands and rocky outcrops are spectacular in this area, and provide some breath-taking scenery, as well as exciting fishing opportunities. 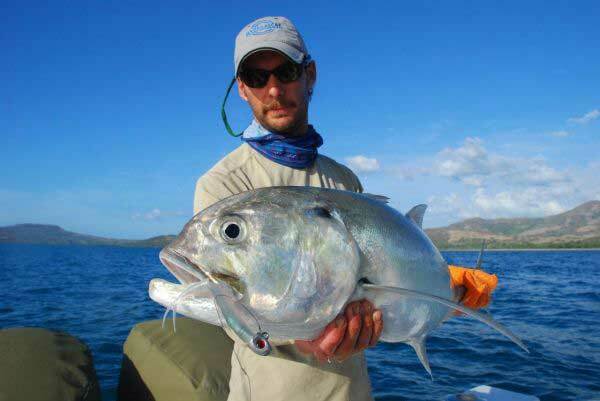 Below is a pic of our guide Brandon King casting for GT's around one of the islands. 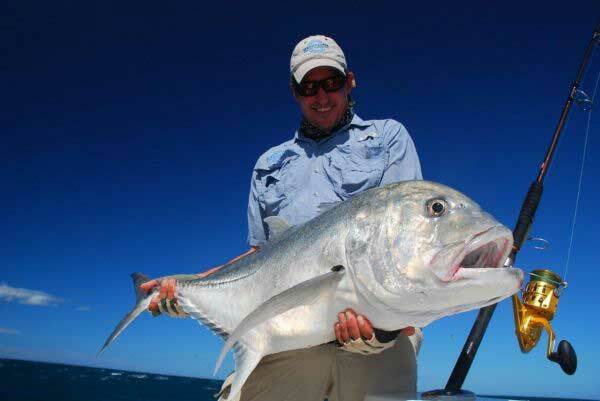 Brandon is fast becoming one of the top fishing guides in the Indian Ocean and it was a real pleasure to fish with him. 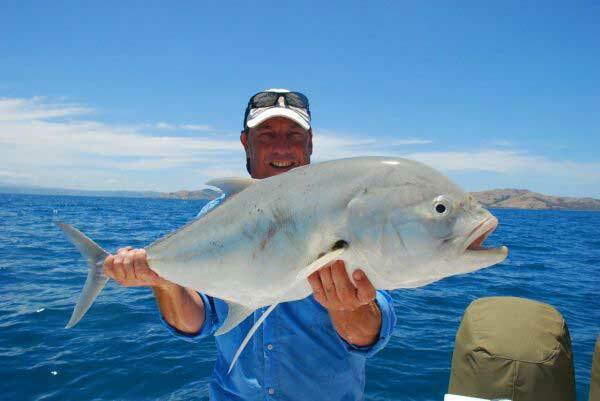 He has a natural water sense that cannot be learnt, and has an uncanny knack to finding fish. Below is a pic of Brandon with another Tille Kingfish that he caught on a drop shot and light tackle. 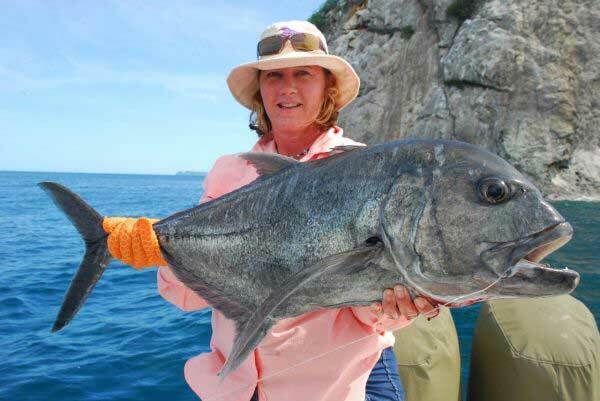 My wife, Pam joined us for a day's fishing as well and also had some fun on the light tackle. 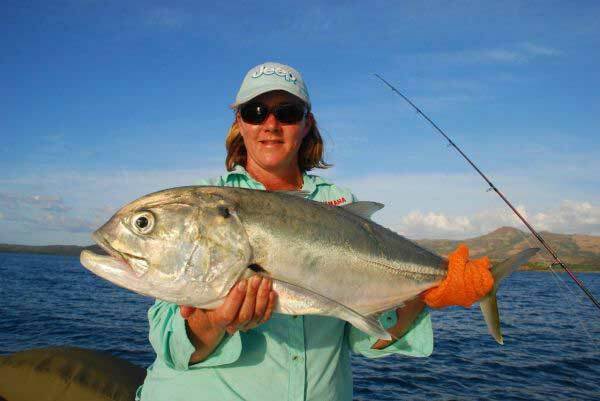 Below is a pic of her with a nice Tille Kingfish that she caught on a dropshot close to where Now Now was anchored. Pam also got a very decent GT on the Berkley Venom Tiger flick stick, which ate a small spoon around one of the islands. This fish gave her a real pull, and she did very well to land it in relatively shallow water on such light gear. We went into a sheltered bay one afternoon and I had the opportunity to cast for river snapper along the edge of some mangroves. 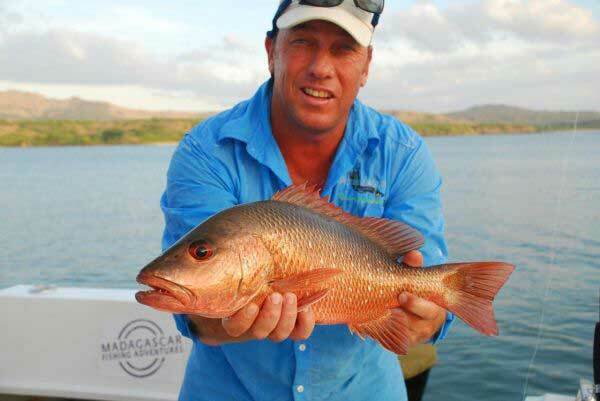 I caught the below snapper on the Sebile Magic swimmer, working it just below the surface. The birds and bonnies popped up at various places during our journey, giving us plenty of opportunity for light tackle fun. They were also accompanied by King Mackerel and sailies. I managed to throw a fly to a sailie, which ate the fly, but spat the hook at the moment that I struck. Another lure that caught some good fish on this trip was the Sebile Stick Shad. This lure is a sinking stick bait, which swims with a lovely side to side action when twitched gently. It can be cast to shoals of baitfish, such as fusiliers, allowed to sink through the shoal, and then twitched back. 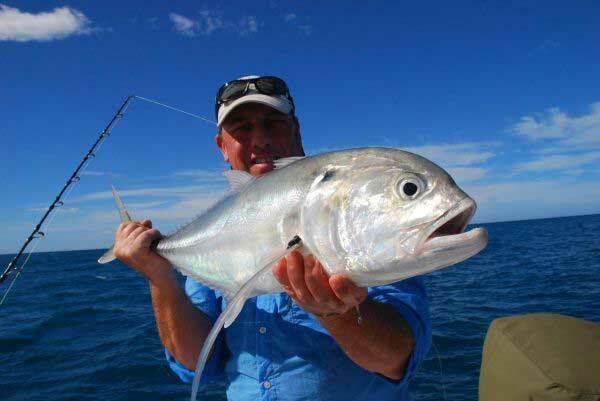 Here is a photo of a Bluefin kingfish that ate the Stick Shad below some fusiliers. All in all it was a great trip, to a fantastic destination, with a really good fishing set up. Brandon took us to some really remote spots, which I would guess have seen very little fishing at all. We got to walk on some islands and cast poppers at GT's in knee-deep water, which was awesome to experience. I landed a fish in the 20kg+ range that I sight cast to, no more than 3m from the side. That sort of thing is getting harder and harder to find these days. A big thank you to Madagascar Fishing Adventures from me for yet another amazing experience, and I look forward to visiting this amazing part of the world again soon!